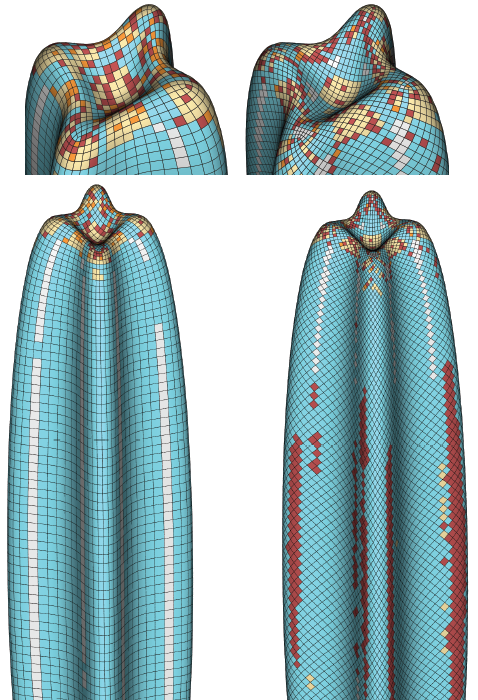 The emergence of large-scale freeform shapes in architecture poses big challenges to the fabrication of such structures. A key problem is the approximation of the design surface by a union of patches, socalled panels, that can be manufactured with a selected technology at reasonable cost, while meeting the design intent and achieving the desired aesthetic quality of panel layout and surface smoothness. The production of curved panels is mostly based on molds. Since the cost of mold fabrication often dominates the panel cost, there is strong incentive to use the same mold for multiple panels. We cast the major practical requirements for architectural surface paneling, including mold reuse, into a global optimization framework that interleaves discrete and continuous optimization steps to minimize production cost while meeting user-specified quality constraints. 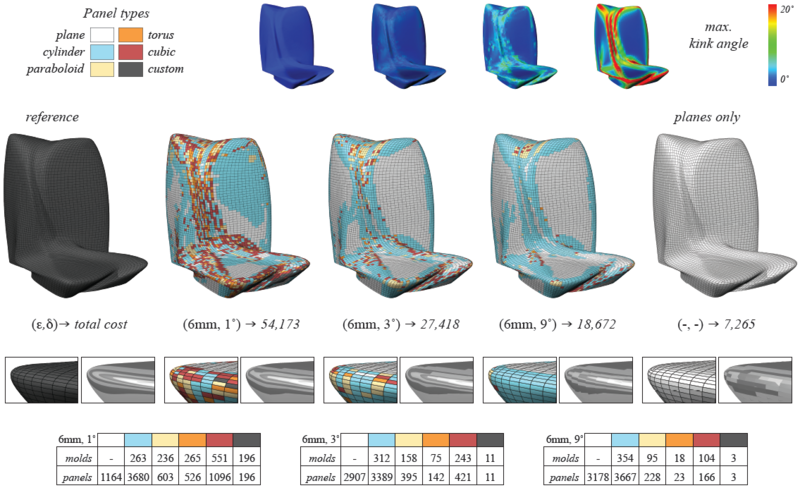 The search space for optimization is mainly generated through controlled deviation from the design surface and tolerances on positional and normal continuity between neighboring panels. A novel 6-dimensional metric space allows us to quickly compute approximate inter-panel distances, which drastically improves the performance of the optimization and enables the handling of complex arrangements with thousands of panels. The practical relevance of our system is demonstrated by paneling solutions for real, cuttingedge architectural freeform design projects. (Figure above) Paneling results with varying kink angle thresholds \delta and fixed divergence thresholds \epsilon = 6mm for the design of the National Holding Headquarters. The images on the right show a solution using only planar panels of which 3,796 do not meet the prescribed divergence threshold. The zooms show reflection lines to illustrate inter-panel continuity which successively improves with lower kink angle thresholds. Paneling solutions for different curve networks on the Lilium tower. 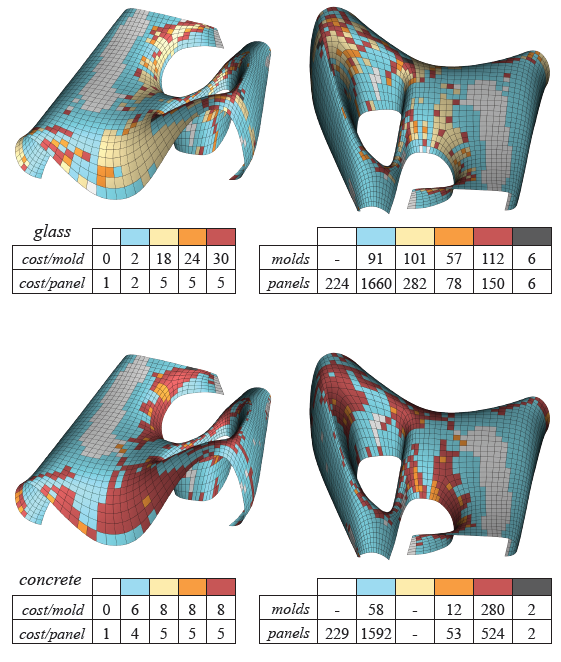 Significant changes in the curve network layout result in different paneling solutions. The left curve network, being closer to a conjugate network, is better suited for rationalization with planar and single curved panels.